Dodgers Blue Heaven: Blog Kiosk: 4/8/2019 - Dodgers Links - Santa Maria! Hobby Podcast: The Card King Sports Variety Show - Brian Cataquet interviews TCMA Cards & Photo File founder Legendary icon Mike Aronstein (podcast link). Just more of the same song and dance. Via Adrienne Alpert at ABC7; "Mayor Eric Garcetti calls for resolution to Dodgers-Spectrum dispute, offers mediation." Per ABC7; "Dodger Stadium fight: LAPD releases descriptions of possible suspects in fight." A witness gave investigators vague descriptions of the two individuals wanted. One of the suspects was described as a young Hispanic man in his mid-20s. He's approximately 5 feet 8 inches tall and weighs about 150 pounds. He was clean shaven and was last seen wearing a gray sweatshirt, blue jeans, and a blue Dodgers baseball cap. The young woman is also described as Hispanic and in her 20s. She's approximately 5 feet 4 inches and weighs about 110 pounds. She has long black hair and was wearing a white Dodgers jersey and blue jean shorts. This is the greatest thing ever! 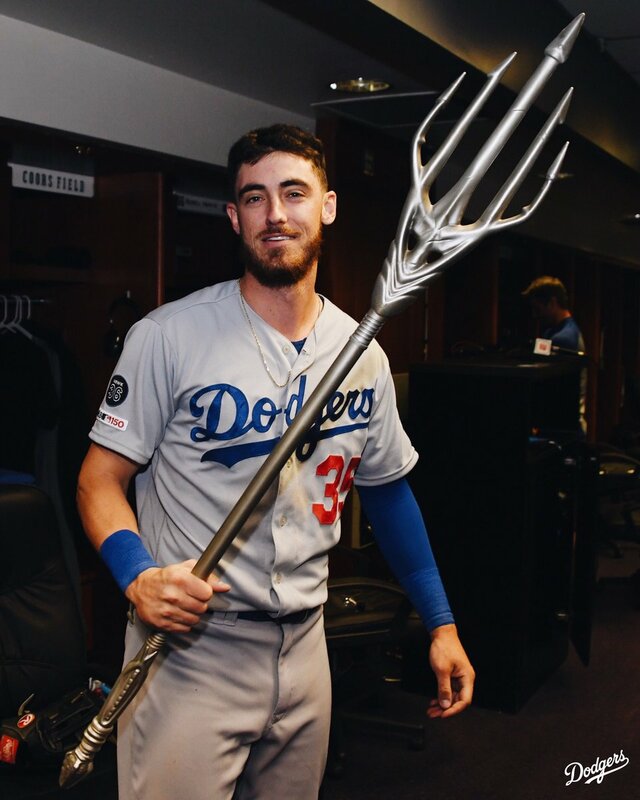 The Dodgers' are awarding their own 'Player of the Game' with a trident... That's right, a TRIDENT! Last night, Cody Bellinger was the recipient. Check it out on the right, via a tweet from the Dodgers. Via Ken Gurnick at MLB.com; "Kershaw set to start for Double-A Tulsa Tuesday." Kershaw said he selected Tulsa over Triple-A Oklahoma City, which plays in Omaha, because of a favorable weather forecast, as well as better facilities being at home with the Drillers rather than on the road with OKC. Via Mike Oz at Yahoo Sports; "'Major League' turns 30: How a Dodgers hero helped turn Hollywood stars into a real baseball team." When Ward was looking for a technical advisor for “Major League,” he turned to the Dodgers and manager Tommy Lasorda. Ward visited the Dodgers’ clubhouse and was eventually pointed in the direction of Steve Yeager. By then, Yeager was retired but lived on in Dodgers lore for winning the World Series co-MVP in 1981. Via Marly Rivera at ESPN; "How Julio Urias changed into 'the Julio I am now'"
Urias: Not so much when it comes to the fans but with the team. A team gives you an opportunity at age 19, they expect very good things from you. And I am not going to lie to you, every time I went out to pitch, I thought about it. Maybe it was lack of experience; I had to learn to give my best as far as I could give. Before, I thought I always had to do an excellent job because I didn't want to fail the team, I didn't want to fail the fans, I didn't want people to say negative things about me. But right now, those are little things that you learn along the way; through the years I have learned that from my teammates. I have changed my mentality from the Julio I was three years ago to the Julio I am now.